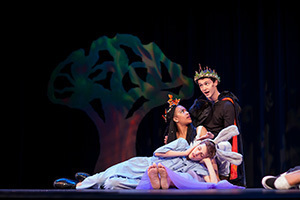 Robinson Shakespeare Company. Photo courtesy of Kaity Fuja, OMG Photography. Seventeen local youth Shakespeare performers will make a memorable “long travel” of their own this summer when they fly to England to perform at the Shakespeare Birthplace Trust’s New Place in Stratford-upon-Avon. The invitation came after the troupe garnered global attention in Shakespeare circles from attendees of the annual Shakespeare Theatre Association conference that was held at Notre Dame last summer. Members of the troupe who have been chosen for the trip are Cameron Pierce, Zion Williams, Sha’Nia Clay, Forest Wallace, Precious Parker, Savannah Dawson, Monica Caponigro, Ellie Graff, Christian Jackson, Kennedi Bridges, Lizzie Graff, Joshua Crudup, Andrew McDonald, Candace Lebron Williams, Paul Ferguson and Ophelia Emmons, who recently placed second in a state-wide Shakespeare monologue competition in Indianapolis. While in England, the RSC will also take classes offered through the Shakespeare Birthplace Trust and the Royal Shakespeare Company with leading Shakespeare directors, scholars and actors. The group will also have exposure to some of the bard’s archive material and will tour Shakespeare’s Globe Theatre. The RSC will be one of the first youth groups to perform at New Place in its inaugural year since re-opening in August 2016. New Place was Shakespeare’s residence, and while his house no longer exists on the grounds, the land is owned and maintained by the Shakespeare Birthplace Trust, an independent charity that cares for Shakespeare heritage sites in Stratford-upon-Avon. The troupe will also experience a taste of college study-abroad life; they will stay in Conway Hall, a residence hall of the University’s London Global Gateway that houses undergraduates during study abroad semesters. Notre Dame International is helping the group prepare for their trip, and the Gateway staff will take the group around London during their time there. Before the trip, the RSC students are not only rehearsing for the play, but also are preparing for the cultural differences they will encounter at “England boot camps” where they are learning about international differences such as cars driving on the opposite side of the road, British pounds and shillings, the local lingo and more. Notre Dame first-year writing students are also helping the students prepare for the trip by coaching them in blog writing techniques so that family and friends can follow their journey from afar. The total cost of the trip is approximately $40,000 and the Company is seeking donations to help with fundraising. While families are each partially contributing to the travel cost, the overall experience is no small financial undertaking, according to Knapp Beudert. Fundraisers are planned for the months ahead and donations are being accepted online at rclc.nd.edu. Originally published by Sue Lister at news.nd.edu on March 08, 2017.